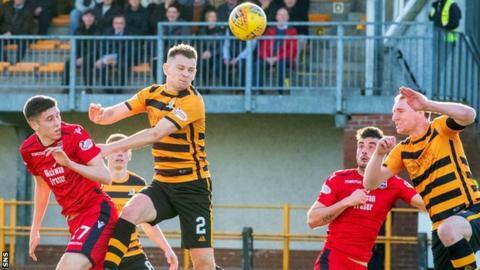 Ross County stay two points clear at the top of the Scottish Championship, despite suffering a second defeat in two league games at Alloa Athletic. Dario Zanatta's strike curled sweetly into the net and moved bottom side Alloa to within two points of Falkirk. Brian Graham, Michael Gardyne and Ross Stewart all had spurned for the leaders but they were spared by Dundee United losing at home to Queen of the South. Alloa, meanwhile, remain three points from safety with six games to play. Alloa Athletic manager Jim Goodwin: "That was a real team effort. It's our first clean sheet for a long time so I'm delighted with that. "The players are loving life in the Championship and are willing to fight and scrap for every goal to maintain Championship status. We've been on a poor run and will take a lot of confidence from that win." Ross County co-manager Steven Ferguson: "We're disappointed. We came here to win but will dust ourselves down and go again. "Credit to Alloa, who made it really difficult for us. We feel it's a missed opportunity." Match ends, Alloa Athletic 1, Ross County 0. Second Half ends, Alloa Athletic 1, Ross County 0. Delay in match Iain Flannigan (Alloa Athletic) because of an injury. Attempt missed. Jamie Lindsay (Ross County) header from the centre of the box is just a bit too high. Corner, Alloa Athletic. Conceded by Tom Grivosti. Delay in match Neil Parry (Alloa Athletic) because of an injury. Attempt saved. Brian Graham (Ross County) right footed shot from the left side of the box is saved in the centre of the goal. Alan Trouten (Alloa Athletic) wins a free kick in the attacking half. Attempt blocked. Ross Stewart (Ross County) header from the centre of the box is blocked. Corner, Ross County. Conceded by Steven Hetherington. Brian Graham (Ross County) is shown the yellow card. Substitution, Ross County. Daniel Armstrong replaces Marcus Fraser. Attempt missed. Ross Stewart (Ross County) right footed shot from a difficult angle on the left is close, but misses to the left. Substitution, Alloa Athletic. Kevin Cawley replaces Jack Aitchison. Attempt missed. Brian Graham (Ross County) right footed shot from the centre of the box is close, but misses to the right. Attempt missed. Alan Trouten (Alloa Athletic) right footed shot from the centre of the box is too high. Substitution, Ross County. Tom Grivosti replaces Keith Watson because of an injury. Attempt saved. Jamie Lindsay (Ross County) header from the centre of the box is saved in the top centre of the goal.